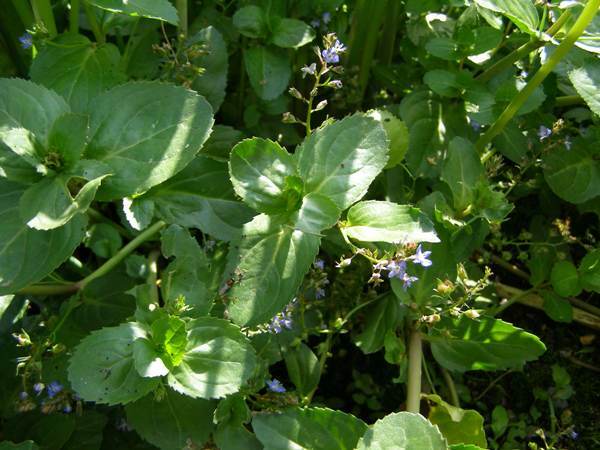 At first glance it could be mistaken for WaterForget-me-nots, but Brooklime has thicker stems and larger leaves that tend to obscure its flower racemes. As a result it is rare to find a 'nice display' of Brooklime in bloom. 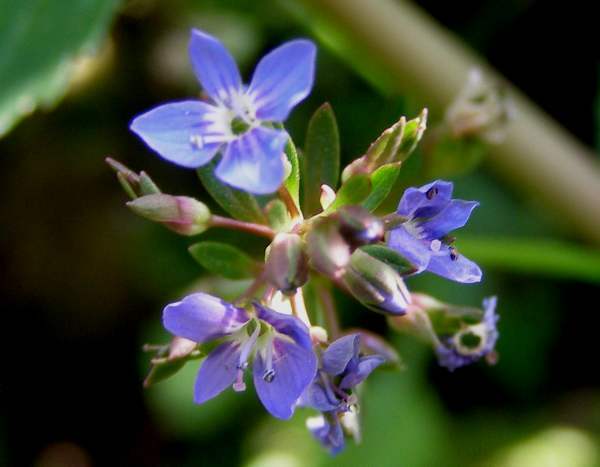 Up to 50cm tall, with thick creeping stems often rooting in mud under water, Brooklime has variable pale blue to dark blue flowers 5 to 8mm across in opposite long-stalked axillary racemes. Brooklime.is common throughout Britain and Ireland except for the far north. Elsewhere in mainland Europe this plant is also quite common. This low-growing member of the speedwell group is found mainly in slow-flowing streams, ditches, and other permanently wet grassy places. The flowers of the brooklime first appear in May, and in shady locations this marsh plant generally continues blooming until September. Juice squeezed from the stems of Brooklime is mildly diuretic. In the past it was used to treat stomach disorders and anemia, but nowadays other herbs are much more popular. Veronica, the genus name, probably comes from the Latin adjective vera- meaning true, and -nica meaning image. When St. Veronica wiped Christ's forehead on they way to his crucifixion on Mount Calvary, an image of his face was left on the cloth she had used. The specific epithet beccabunga is of uncertain origin. One suggestion is that it comes from the Flemmish bechpunge, meaning mouth smart - a reference to the bitter taste of the leaves. An alternative source might be the German bachbunge, which means brook-bunch - a bunch of flowers growing in a brook... however, we are grateful to Thomas Dijkman of Amsterdam, an authority on the medicinal uses of plants, who tells us that...In Holland researchers say that the Latin word really comes from the Dutch word beekpunge or beekbunge. Dutch and flemish are the same language with a difference of dialect. Old German and Old Dutch also are very similar languages. So the origin of the word beccabunga is the Dutch word beekbunge, and in Belgium and Flanders they have similar folk names for this plant. The words ´beek´, ´bech´, and ´bach´ all mean ´brook´ or ´creek´. Germander Speedwell Veronica chamaedrys has similar blue flowers; it has two lines of long hairs on opposite sides of its stems, and it grows in meadows, in hedgerows, in sparse deciduous woodland and on mountain slopes. The plants shown on this page were photographed in West Wales in July.